This courtroom sketch shows Paul Manafort listening to Judge Amy Berman Jackson in the U.S. District Courtroom during his sentencing hearing in Washington on Wednesday. Jackson said Manafort could serve some of the prison sentence at the same time he was serving in prison for his other case. But the judge in Washington ultimately increased the total amount of prison time. 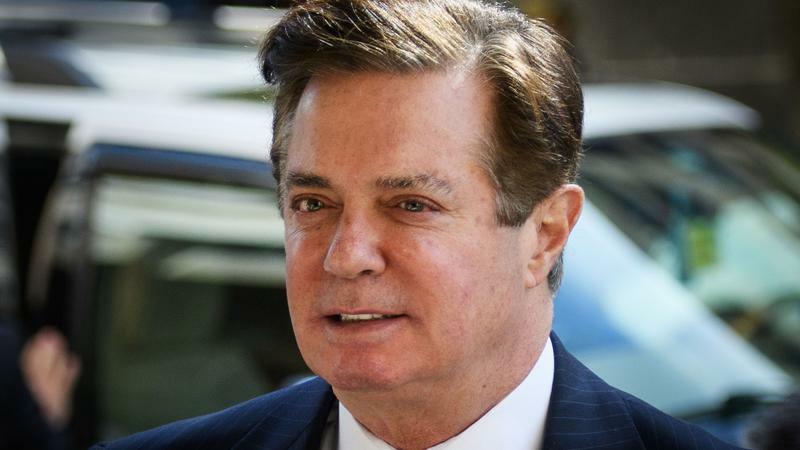 A federal judge in Virginia had sentenced Manafort to just under four years in federal prison and ordered that he pay $24.8 million in restitution and a $50,000 fine. Separately on Wednesday, Manhattan District Attorney Cyrus Vance announced that a grand jury in New York City had returned an indictment of its own against Manafort. Vance's statement described "a yearlong residential mortgage fraud scheme through which Manafort and others falsified business records to illegally obtain millions of dollars." The New York City case not only added to Manafort's legal woes but also multiplied them. If convicted and imprisoned in New York, a presidential pardon could not provide him clemency on the state charges. Prior to Manafort's being sentenced in federal court or the announcement of the state indictment, President Trump had declined to rule out the prospect of a pardon for the federal crimes of which Manafort has pleaded guilty or been convicted. Trump said on Wednesday that he feels "very badly" for Manafort and that he has been the victim of a "sad situation." As to a pardon, however, Trump said: "I have not even given it a thought as of this moment. It's not something that's right now on my mind." 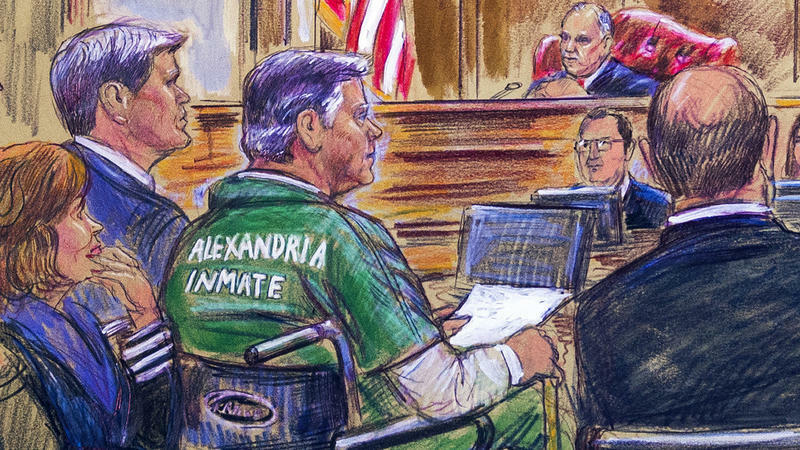 Manafort appeared in court in Washington on Wednesday in a dark business suit — a change from the green prison uniform in his Virginia hearing — sitting in the wheelchair he has used since attorneys say he developed health problems while in jail. 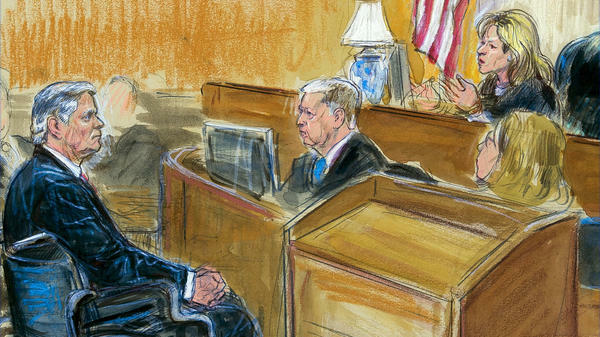 Manafort's hair is now mostly gray, and he reviewed documents in court ahead of the judge's ruling. A number of people wrote letters to Jackson supporting Manafort including his wife, one of his daughters and his brother. Jackson said she read all the letters before determining his sentence. 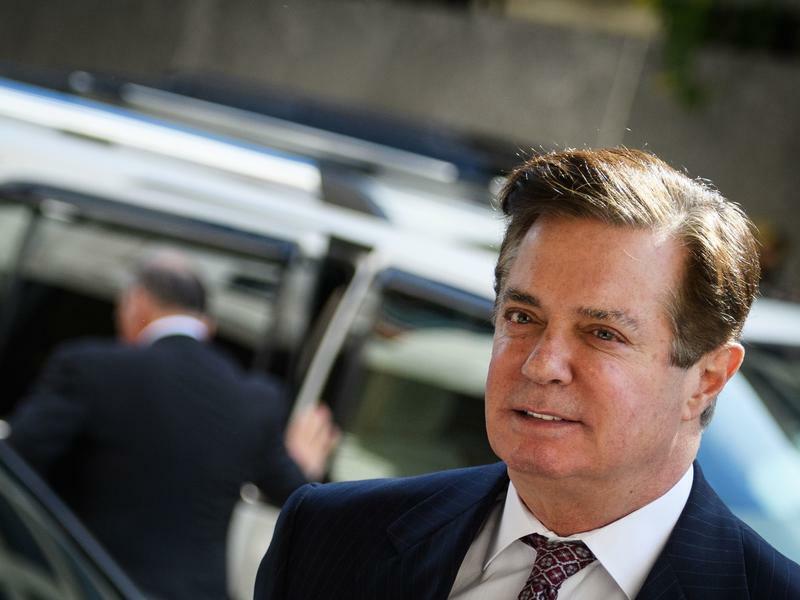 The potential maximum penalty in the case was 10 years, although the judge said sentencing guidelines in the case contemplated more time given the amount of money involved with the conspiracy that Manafort admitted. An important question for Jackson, she said, was whether Manafort had been an "organizer or leader" of the offenses. That affects what the judge called the "algebra" involved with determining prison sentences, she said. Manafort pleaded guilty to conspiracy charges in the Washington, D.C., case in order to avoid a trial last year. He admitted that he had concealed from authorities the work he was doing for political clients in Ukraine and that he had schemed with a partner to try to persuade potential jurors to lie about it. One key figure in that scheme was Manafort's partner Konstantin Kilimnik, whom prosecutors have linked with Russia's intelligence services. He was indicted on conspiracy charges last summer. Manafort agreed to cooperate with prosecutors after his guilty plea, but the office of Justice Department special counsel Robert Mueller said he began lying in his interviews. Prosecutors had asked the judge not to take Manafort's cooperation into consideration when assessing what sentence he should receive and, on Wednesday, the government argued he deserved a serious punishment. "We're here today for crimes that Paul Manafort committed for over a decade" — crimes that involved over 30 offshore accounts in at least three foreign countries, hiding income he used "to fuel his extravagant lifestyle," prosecutor Andrew Weissmann told the judge. "Mr. Manafort committed crimes that undermined our political process and subverted the due process of law." Manafort and his attorneys argued that he hadn't knowingly engaged in a pattern of deception with the prosecutors in the case and that his cooperation agreement should stay in force — that he should get credit for his plea and for the information he had given the government. Jackson ultimately ruled that out. The political environment since Manafort's indictment has been "very harsh," attorney Kevin Downing told the judge. The only reason for the case was Manafort's tenure as chairman of Trump's successful campaign in 2016. "But for a short stint as campaign manager in a presidential election, I don't think we'd be here today," Downing said. Manafort himself was less combative. "I am sorry for what I have done and for all the activities that have gotten us here today," he told the judge. "Let me be very clear: I accept responsibility for the acts that have brought us here today." "I can say to you with confidence that my behavior will be very different," Manafort told the judge. "This case has taken everything from me already," he said, asking the judge to let him and his wife be together. All the same, Jackson said Wednesday that she was satisfied that Manafort had been the "leader" of the conspiracy offenses described in the court materials and she wasn't convinced that she should go easy. "It's hard to overstate the number of lies, the amount of fraud involved ... and there is no good explanation to warrant the leniency requested," she said. "More houses than a family can enjoy; more suits than one man can wear." As to the political atmosphere, Jackson said she could not opine about the public perception or the broader Russia imbroglio because it was not a subject of the matter at hand. "The defendant is not public enemy No. 1, but he's not a victim either," the judge said. She said the issue of Russian conspiracy was not presented in the case and "therefore it was not resolved." The issue of whether Manafort might have been involved with the Russians who interfered in the 2016 election is a red herring, Jackson said, unconnected to his actual court case. It's not even clear whether that is true, she said, given that the special counsel's work is ongoing. What was true, Jackson said, is that Mueller's team had proved by a preponderance of the evidence that Manafort had "intentionally lied" about a key meeting between himself, Kilimnick and Manafort's former protege, Rick Gates. Gates reached his own cooperation agreement with prosecutors and was the government's star witness in the Virginia case last year. He has apparently been giving prosecutors a great deal of information about various investigations into Trump world and has not yet been sentenced.